Black deer trade poses health threat for whitetail population. It’s a humid summer evening in central Texas, and a man we’ll call Cal is about to make an illegal purchase. As a result, his anxiety level is high. His palms are damp, his heart is racing and his mouth is dry. The item in this particular transaction isn’t a bale of marijuana or a stolen laptop, or even a crate of bootleg CDs. It’s an 11-point white-tailed buck with highly desirable drop-tine antlers off each main beam. Eyeballing the deer, which has just been darted with a tranquilizer gun, Cal agrees that this buck will earn a Boone & Crockett score of at least 150, as promised. A trophy by most standards, and a bargain for $2,000. Cal pays the price — in cash, of course — and just like that, the deer is his. No permits, no inspections, no hassles from state game wardens or biologists. As he hauls the animal away in the back of a livestock trailer, Cal can’t help but smile. The buck is no longer just a deer; now it is evidence, because Cal is a sergeant with the Special Operations Unit (SOU) of the TPWD’s law enforcement division. His investigation is just beginning. Cal remains undercover, working with a confidential informant, communicating with his circle of new acquaintances, and it isn’t long before a “deer broker” tells Cal he can get $5,000 for the 11-pointer. The broker has a customer, a landowner, who figures a hunter will pay at least $6,500 for the opportunity to bag this deer. In a marketplace where premium trophy bucks sometimes sell for tens of thousands of dollars, the landowner is no doubt correct. Cal takes the deal. The broker charges $1,000 for his services, and Cal ends up with a net profit of $2,000. Not bad for five days’ work. And money, as you might expect, is what drives the black-market deer industry. 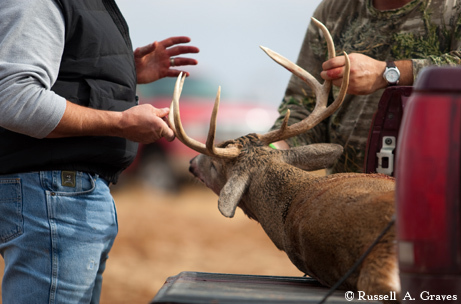 A “shooter buck” is exactly what it sounds like — a deer that is purchased solely to be hunted. For instance, a landowner with hunters coming soon might contact a broker and request a trailer full of trophy bucks. In many cases, the hunters might not even know that the deer were brought in just for them. This sort of arrangement is known as “put and take,” where a deer could be hauled in one week and shot the next. Shooter bucks constitute a large portion of the black market, but deer — even does and fawns — are also bought and sold illegally for breeding purposes. Ironically, much of what the black marketers do — possessing deer, raising them in pens, buying and selling them for hunting and breeding — can be done legally with the proper permits from the state. At present, there are more than a thousand licensed deer breeders in Texas, with approximately 86,000 deer enclosed in their facilities. (It’s worth noting that, technically speaking, these deer remain the property of the people of the state of Texas.) Each of these animals is issued a “unique number,” which is tattooed into its ear, and wears a tag that identifies the breeding facility. But there are some things that nobody, not even a licensed breeder, can do legally. Buying, selling or capturing wild deer, for instance, is strictly prohibited. However, in a state with 4 million deer, the temptation can prove too great. The 11-pointer that Cal bought was a wild deer; the man who sold it wanted to cull the native deer off his high-fenced property and replace them with deer he considered genetically superior. While the overwhelming majority of licensed breeders abide by state laws and regulations, infractions do happen. 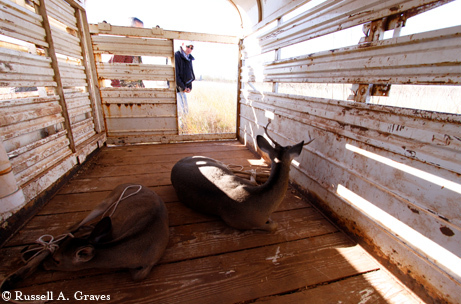 The landowner who receives the fictitious shipment can then put those unique numbers on deer captured from the wild. What particularly concerns biologists, law-abiding breeders and just about anyone with an interest in Texas whitetails are deer brought in from out of state. Currently, the Texas border is closed to incoming white-tailed deer, whether wild or from a breeding facility, with no exceptions. The threat of disease transmission is just too great. But, again, that restriction doesn’t stop black marketers. “Big bucks from out of state are selling for cheaper and they’re abundant,” Cal explains. “If a landowner has hunters coming and he needs 10 trophy bucks, it’s a whole lot cheaper to smuggle them out of Ohio, Iowa or Oklahoma.” Cal says that the man who sold him the 11-pointer committed multiple infractions over the course of the investigation, including hauling a trailer full of illegal deer into Texas. One of the biggest challenges the SOU faces is the difficulty in catching violators in the act. That’s why members of the unit use a variety of methods and tactics, including covert operations, to conduct their investigations. Cal, for instance, has a fully formed alias, including a driver’s license, Social Security number, bank account and cell phone account, with two vehicles — a truck and a livestock trailer — registered under that name. The SOU also uses the latest technology to gather evidence and build rock-solid cases. Say a suspect drives to Wisconsin to bring a shipment of deer back to Texas. It’s possible he’ll be carrying a small tracking device — approved by court order — affixed discretely to his vehicle’s undercarriage. As a result, investigators will know the suspect’s every stopping point, how long he remained at each location and what time he got back on the road. The tracker also helps ensure an investigator’s safety. Even the deer are occasionally modified with _technology. That drop-tine 11-pointer Cal bought? Before he sold it, a microchip was implanted in the deer’s neck for positive identification at a later date, if necessary. This is easier than DNA profiling or other forensic _testing, which is also available. 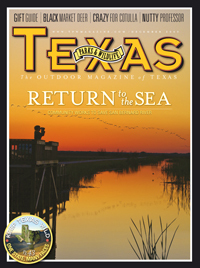 The Texas border is closed to incoming white-tailed deer, and Kevin Schwausch supports the restriction. Schwausch is the Big Game Program Specialist with the Texas Parks and Wildlife Department, and he wants the public to understand the risk that even a single imported deer can pose to the native resources in our state. As it stands now, Texas is free of the two most problematic deer diseases — tuberculosis and chronic wasting disease — and it would benefit us all to keep it that way. Non-hunters may think this threat doesn’t concern them, but they’d be wrong. As Schwausch is quick to point out, hunting in Texas is a $2.2 billion industry, and any negative impact on hunting can spread across the statewide economy. For example, states that discover chronic wasting disease in the deer population typically see an initial drop in the sales of hunting licenses. This can create a ripple effect. Motels, restaurants and sporting goods stores experience a slowdown. Landowners have a more difficult time attracting hunters. Another concern is that some of these diseases can transmit to other species. Tuberculosis, for instance, can make its way from deer into cattle. In 2008, a Grimes County deer breeder was convicted of smuggling 14 white-tailed bucks into the state from Minnesota, where tuberculosis has been a problem in the deer and cattle populations. He received a sentence of 18 months in a federal prison, 36 months probation and a fine of $50,000. Some people might think the penalty was harsh, but considering the repercussions that might have resulted from the man’s actions, others might argue that he got off easy.